There is currently just the 1 ferry route running between Pico and Graciosa operated by 1 ferry company – Atlanticoline. The Sao Roque to Vila da Praia ferry crossing operates weekly with a scheduled sailing duration from about 3 hours 15 minutes. Whilst we’ve taken great care to ensure the information on this page is correct, as the frequency and duration of crossings on all routes can vary from time to time we’d advise that you get a live quote for current availability on this Pico Graciosa crossing between Sao Roque and Vila da Praia. Graciosa is a UNESCO World Biosphere Reserve island in the Azores, a Portuguese archipelago in the North Atlantic Ocean. Portuguese for ‘graceful’ and nicknamed the ‘white island’, Graciosa is one of the most peaceful and picturesque of the island chain, characterised by rolling hills and whitewashed houses. And with roots in the farming industry, the landscape is primarily wheat fields and vineyards, producing some of the finest wines in the country. 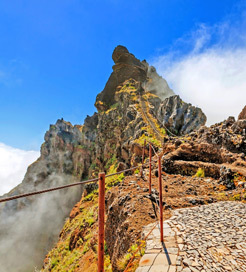 Relaxing in natural thermal pools, exploring sulphur caverns and deep sea diving are popular excursions on Graciosa, and the beautiful, main settlement of Santa Cruz has narrow, cobbled streets and a charming central square which are well worth seeing. Graciosa sits in a relatively central position within the Azores, so travelling by ferry is a convenient and popular way to get there. 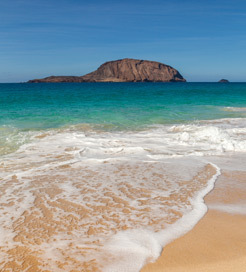 Routes are available from nearly every other island, with ferries docking in Vila da Praia on Graciosa’s east coast.